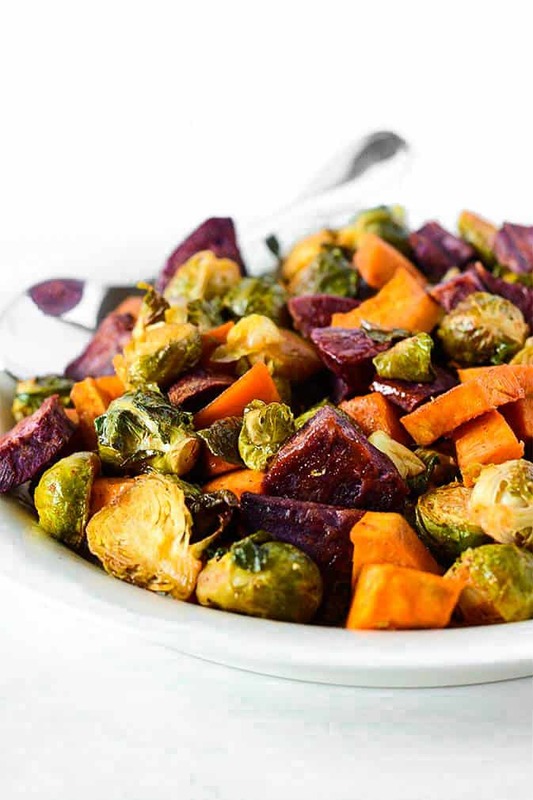 These Maple Roasted Brussels Sprouts and Sweet Potatoes are the perfect colorful side dish for your holiday table, they are so pretty! This classic Thanksgiving side dish will be a tasty treat for your Thanksgiving menu. Roasting vegetables is one of the best ways to enjoy them especially if you are serving people who hate eating vegetables. These Roasted Brussels Sprouts and Sweet Potatoes are easy to make and the maple syrup and smoked paprika add a delicious sweet and smoky flavor! 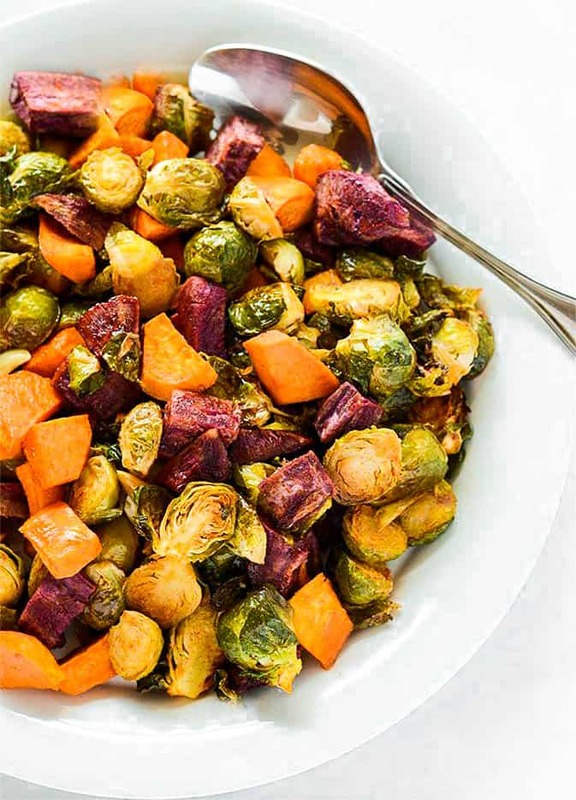 These roasted brussels sprouts with maple syrup and sweet potatoes are the perfect side dish to serve for the holidays along with Lentil Meatballs, Mashed Potatoes, and Cranberry Sauce. 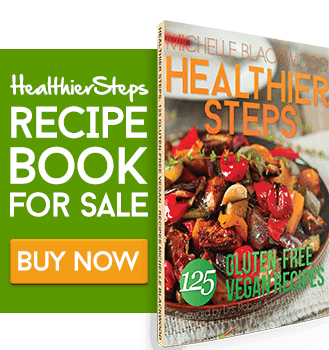 How To Make Maple Roasted Brussels Sprouts and Sweet Potatoes? Preheat oven 400 degrees F. Prepare baking sheet with lightly oiled parchment paper. 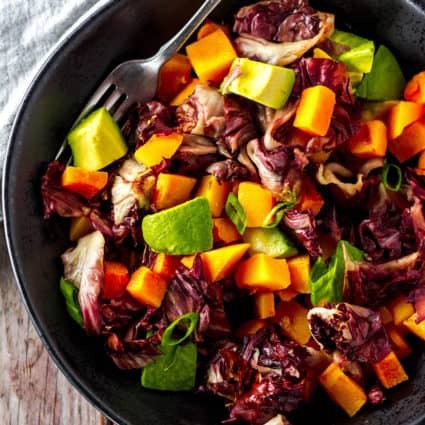 Place Brussels sprouts, cubed sweet potatoes, olive oil, garlic, maple syrup, lemon juiced, smoked paprika and salt in a large bowl and toss to fully coat. Spread veggies in a single layer on baking sheet. Roast for 30 minutes, turning halfway until tender. I added purple sweet potatoes just for the color so you can just use regular orange-fleshed sweet potatoes. 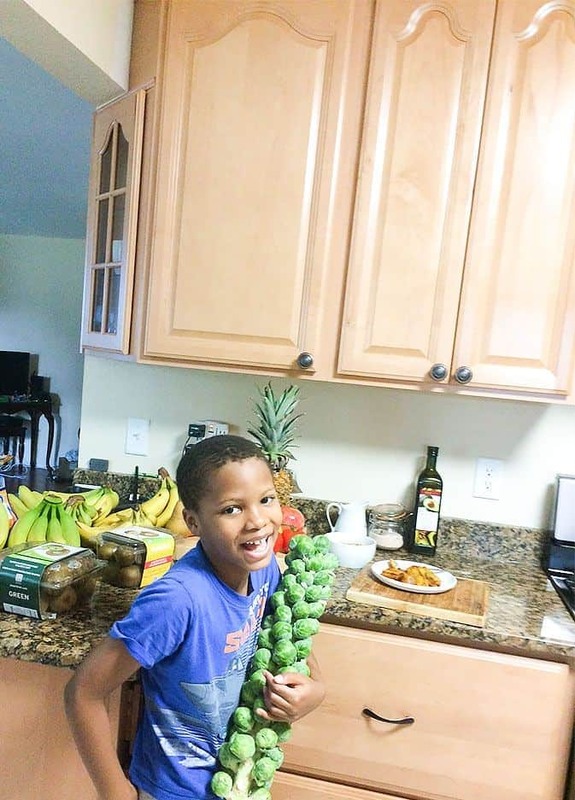 My son Daevyd was so fascinated with seeing Brussels Sprouts on their trunk, I just had to capture the moment. I knew that he would most likely enjoy them once they are roasted. 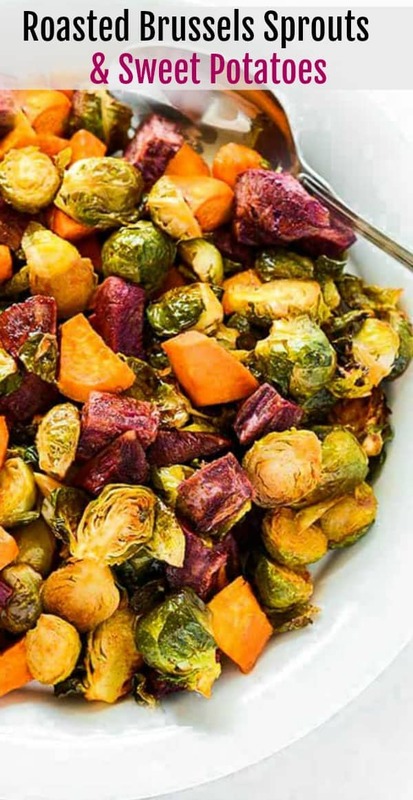 If you make this Maple Roasted Brussels Sprouts and Sweet Potatoes, snap a photo and hashtag #healthiersteps — we love to see your recipes on Instagram, Facebook & Twitter! This looks great. I am always looking for more ways to enjoy root vegetables. I am not big on maple syrup, but am going to try this. I do make something like this with sweet potatoes, turnips, red onions and carrots, with a honey glaze (I know, not strictly vegan), but this looks interesting and will get tried. Question, however. What are the red/purple pieces in the picture? I thought red onion at first, then took a closer look. Do you have red sweet potatoes where you are? Robert, thank you. Yes, the red pieces are sweet potato. We have lots of different kind of sweet potatoes here in Florida. Hope you enjoy my variation and I love turnip and rutabaga so I know yours is also great. So Delicious. I made this flavourful dish for my family’s Christmas potluck and it was thoroughly enjoyed by young and old alike. 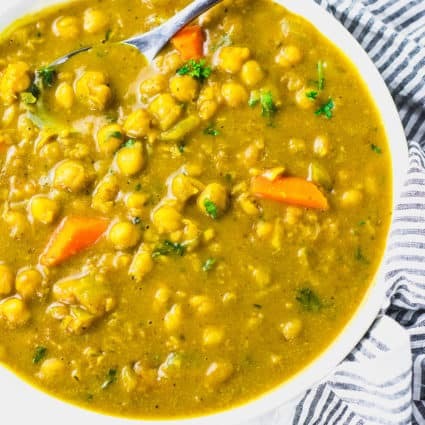 It has become a favourite of mine to make anytime, now. Thank you, Anna, for your feedback, so happy you and your family loved it. I just bought some Brussel’s Sprouts so I’m going to make it this week.